:eek:Don't you just love it! Ohhh, and Marc, perhaps that intel was misleading, a plant, ever seen the movie,"The Sting". Well - a turn of moderate to above moderate frustration. I was ready for some decent success this turn, and the beginning of Marc's journey down the slippery slope, but it pretty much failed to materialise! You'll notice the defending corps is badly damaged, but I have deliberately let you all see the stats at the bottom for the mighty Desert Rats. Ummm - not good. Now the key here is supply. Ideally at all times you want units on a minimum supply of 6, and 8 or above is much better. However to do this HQs are vital - they carry supply and draw it from nearby towns and cities. Trouble is here that my HQ is not near enough to a supply centre, so its own supply has dropped to 5, and my adjacent armour is now down to 3. This is not good - cant easily reinforce (as full reinforcement is only available if you have supply 6 or better) and my readiness and morale will fall under these conditions. The special forces unit next door is in much better shape, but taking Tehran has become a case of underestimated resistance. In my hurry to take it I failed to reinforce my armour to 10 prior to invasion, and also miscalculated the speed of my armour initially, and by not getting it to Tehran straight away it allowed Marc to upgrade the weapons of the Iranian Corps. Whether I can take it next turn I dont know - we will see - but it will probably now require an adjustment of deployment and that is annoying! ... and the East??? Bloody mud at the end of May. Huh - that's not good either, and it postponed my planned action. So all in all 3 areas I had wanted to start off, and none done. In the attack I found several Tac Bombers as you can see, so I guess that confirms where Marc is intending to squeeze me next. So mostly frustrated, but some limited success in the East. Just as soon as the damned weather sorts itself out in the West we should have lots more to report! A slight set back Al, NBD! Great graphic of the importance of HQ supply coordination and I might add that in the beginning of a campaign I always pan the map for units with low supply. Usually, depending of course, one of the very first moves in SC I make is spending MPPs to get units up to >5 strength and moving them into supply situations of also greater than 5. What this does is maximize their morale and readiness early so that they are available for operations. Now, upon that accomplishment first, the secondary directive is to get them into a deployment stage where they can move immediately on my orders, ie. port access, and don't forget to keep a reserve of MPPs for transport. Agreed SM. My error with the Desert Rats was partly caused by combat though - they had driven the Italians out, invaded and taken Syria, done the same in Iraq and were therefore rather battleworn. Initially I had them in supply 6 or 7 just prior to the invasion of Persia - what I should have done was leave them there for a turn or two... but actually your post about oil a page or two back possibly triggered me earlier than I would otherwise have done. Wanted to show you we were on the same wavelength! Heck yes Al, it's easy to see you have a refined discipline of play, I thought since you were schooling our newcomers, I'd add to the information pool, just to let them know different approaches to opening game moves. Don't let me take you off your gameplan, I'm just throwing out ideas for you to consider, kind of making Marc think about different things also. You kind of got a little off track on that Spanish bid, but things are evening out, thanks to your judicious play. Most enjoyable, both you guys are keeping this real interesting, thanks. Sorry for the delay in turns. I've been a little busy with work, my show, and a SciFi novel that my editor has been hounding me about... not to mention the attention that my two little girls demand. 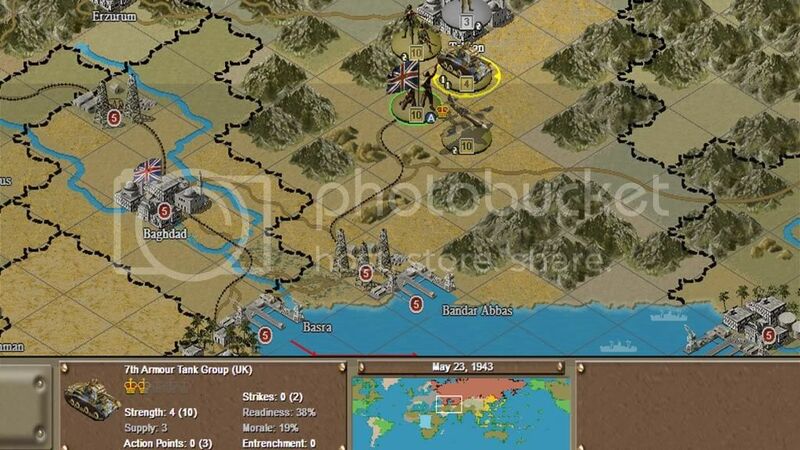 Game wise... it is middle of June 1943... I made a decision to pull back my troops in South Russia. Air intel showed Al building up large force to hit me. My lines were essentially in a bulge bending around Rostov and south to the Oil field which I have held for some time. I left a few speedbumps/units for Al to play with as he lunges forward. I had considered attacking but the ground was terrible... mud and likely it would be fine the next turn meaning Al would have probably hit me first. I am confident he has the majority of his forces in the South... while I had held an elongated front. My front in the south is shortened, I am closer to my supply source, my army is powerful and in one piece. In addition Turkey is likely to join the Allies shortly and it made sense to have the front a smaller and in a more confined space. Should Al lunge foward, my new front lines allow me to easily hammer him back. I gave up 35 income in captured resouces to Al. It does not sound like a lot but it is. I also made the decision to not reinforce the Persian corps this turn. It had been a drain on the UK for the last few turns and I am betting Al brought up tac air... repairing it is also a drain on Germany. So he can have Persia. In the North I remained in place. My troops are entrenched with supporting armor and air. I also occupy some good ground. If he attacks it will be costly and my counter attack should be more costly to him. In Asia I have a firm idea where Al's fleet is East of the Solomons. (good intel) I almost elected to hit him as I had 4 carriers in range with a good sized fleet. In the end I elected not to. The US has a large navy and I want more carriers in range should I elect to hammer him... sadly 3 others were just out of range of the carrier I could see thanks to Intel. There was a little action in Burma. In China... Al is tearing up my forces there. Supply is not the best for the Japanese... I decided to reinforce and consolidate my units there... I expect Al to hit me hard again this turn, however my Chinese forces have lacked for resources these last few turns... as I had them directed elsewhere. No longer. My TAC air is up to strength and I expect things to get interesting shortly. It has been a very interesting game so far. I am sure some of my moves have given Al a bit of Acid Reflux. Oh... and did I mention there are Axis naval units operating in the Indian ocean? You, my dear Marc, are a very fine opponent. 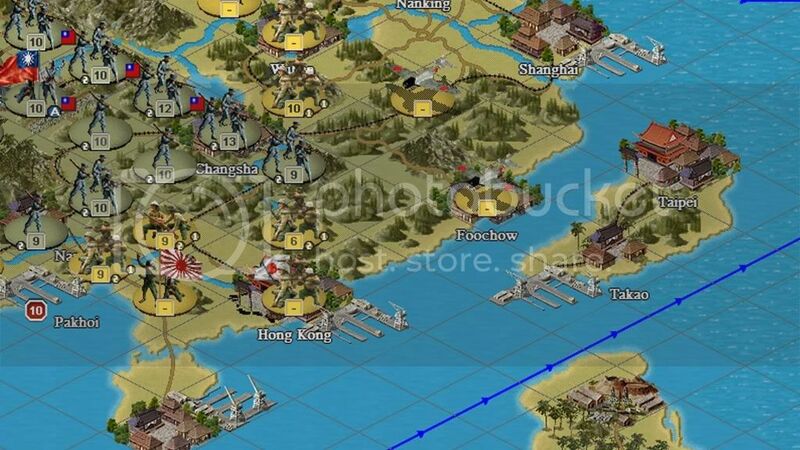 I'm wondering, as Axis, have you found the Changsha position to be impregnable as I have? OK - this was a very big turn for the allies, bigger than I expected. Helps balance out the disappointment of last turn and the bad weather! 2. Colombia joined the allies.Very timely, and more lovely oil. Saw the mpp boost immediately at the end of the turn. 3. 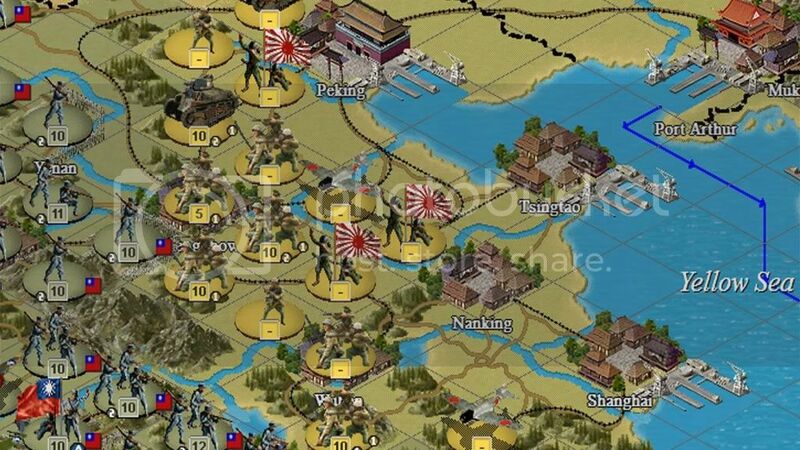 China launched further attacks in the south to try and pin down, attrite and generally annoy the Japanese High Command. Another army was destroyed and the front looks like this, not good for the Japanese..
4. The offensive in Burma made ground. 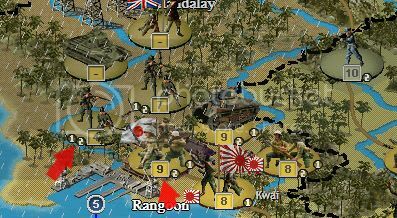 A Jap Sepcial forces unit was mauled and forced to retreat, and I pushed forward far enough to damage the Japanese HQ in command. Ultimately my only failure was in Turkey where I didnt get a diplo hit. I have been investing very heavily in Turkey, maybe too heavily, but if the axis had pushed on into Russia then an ally declaring to my side on the southern edge of Russia would have been very handy indeed. I think they currently stand at 33% allied having come down from about 88% pro axis. More hits will follows - they will be an allied power before winter arrives for sure. 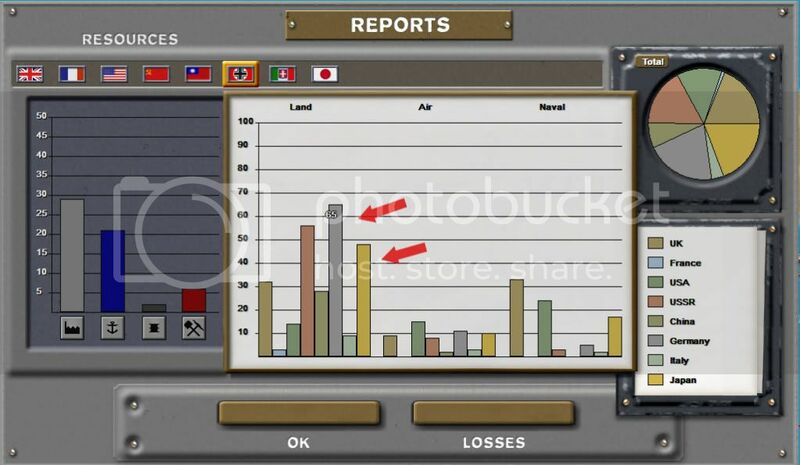 not looking good for Adolf and Tojo here... I think CH has a clear initiative and advantage as the allied industrial might and beefed-up forces will now tell. Something needs to be done with this Chinese juggernaut, especially the Changsha position which benefits from too many DBs. Wow! Al, that is scary, your CVs are in restricted waters and way to close to Axis air, that may be regrettable. I hope so. :-) - what I want is for his tac air to leave the East. That graphic doesnt show how much fighter air cover I have anyway - US fighter tech is higher than the modest UK level 2 - so any attacks on the carriers would be opposed. German tac air is key - be assured that wherever it isnt I will attack... and if it is split then it wont be enough to stop me in either theatre. A little bait is never a bad thing...! I thought maybe that might be the case, a calculated risk, and after all it is a little later in the game. I've made this mistake early and things didn't turn out good, lost or damaged carriers are a burden the UK cannot bare in the early years. And besides, now that I think about it, you've pretty much destroyed the Axis navy, get ready to set the hook! Al hammered me pretty hard in China. I can virtually do nothing against the Chinese... even with 4 upgraded Tac air units. It is a bit frustrating. Supply is a real issue and I was forced to make some strategic moves to hopefully draw Al out of the hills. Burma is a stalemate. The IJN is strong. I suspect that Al has moved Russian units east. He did not attack me in force in the West. My only bright spot is in the West. Germany is very strong. 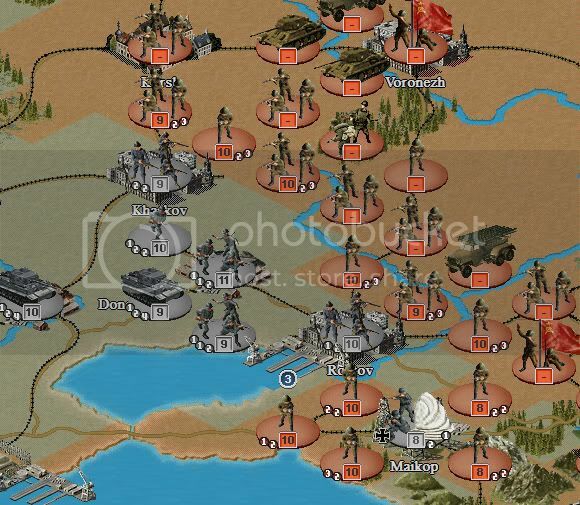 If Al hits Japan with Russia I will go all out on the Eastern front. The Western Front is in great shape. I destroyed 1 UK corps and should get the other two this upcoming turn. It will be interesting to see if Al goes all in in the West. He almost has me on the ropes. It is his game to lose at this point. What were the main critical moments that you think might have made a difference? Changsa seems to be a key in China and even spending carrier assets to pummel it and ignore everything alse in the Chinese theater. It's a tough nut to crack but it is the key I think. Do you think rolling all out in the East before the Reds were able to catch a breath would have made a difference? UK theatrics could have been ignored for the moment without US support as it would be easily contained. With Spain coming on your side I thought it was game over but I was mistaken. It's not over yet, and I really appreciate your game on this and great good efforts on both sides. With Spain coming on your side as part of your main strategy, do you think that you could have preserved the KM and linked up with the Italian navy in the med and give the Allies big headaches in the mid-east? Possibility of later linking up with the IJN would have been a devastating blow. I think we are beginning a debrief WAY too early. There is a lot still to be done, not least the Red Army / Wehrmacht clash, and the pacific slugfest between the US Navy and the IJN. Everything else so far has been window dressing... though it is certain that the allies have the mpp advantage now. That, however, is not the whole story. Read Richard Overy's "Why the Allies Won" - an alternative take on the "victory was inevitable becuase of economic advantage." 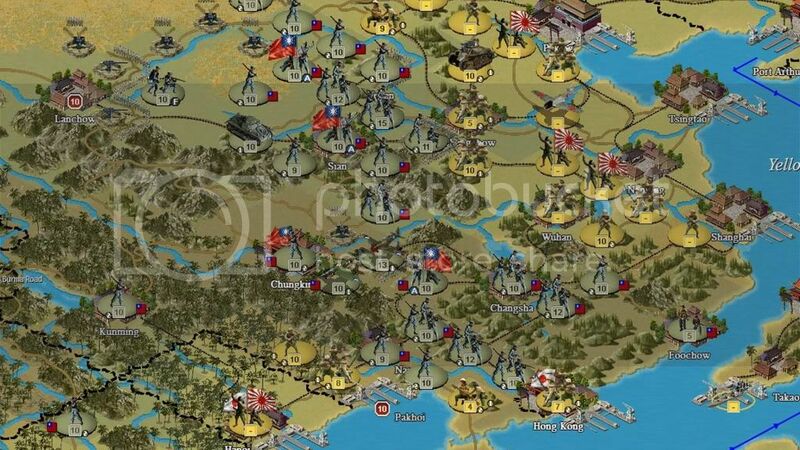 Victory has to be won on the battlefield - if my Red army gets turned over then the mpp advantage becomes rather irrelevant and will be quickly reversed anyway. Well - all of you looking for big action will be disappointed with this post and so I have not bothered with a graphic. We are still engaged in 4 theatres of operations: Russia, France, Burma and China and all 4 were pretty quiet. I expanded my advance in southern China a bit destroying yet another Japanese Army, but the weather in Burma was bad so I held off, and I scratched my head for a bit in Europe and did little. 1. The intel my advance D Day has given me is that German Armour and Tac Air remains in the East. That is probably wise of Marc - to have shifted it West would have meant an open door for the Red Army. 2. That being the case I need to really hit the front hard in France... and I am not absolutely totally ready yet. If I go too early from here and lose a hatful of stuff it will set me back. I have very big air power, but ground tech and units are not all exactly where I want them, and even my air power needed some juggling to get it best positioned. So - I pinged a corps in NW France and otherwise sat tight. In the East my slow advance continued, but nothing of note. 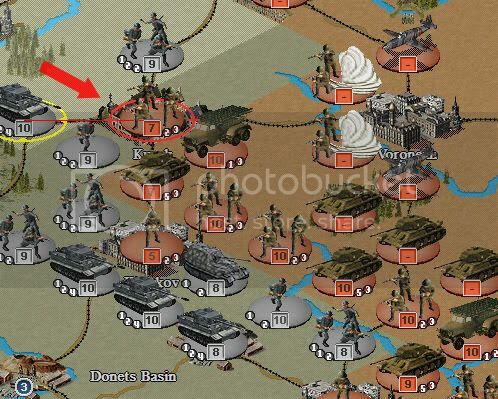 Marc has fallen back quite a long way in Southern Russia so while the Rostov Army was reduced to 3 I couldnt quite take it, and elsewhere I moved up and positioned myself ready for next turn. One weird thing - the Paras I surrounded on the Maikop Oil Square had supply 3. I had always thought that resources did not give direct supply... either that or some weird "Rostov Trail" through my lines has seen German black market suppliers getting food in!! 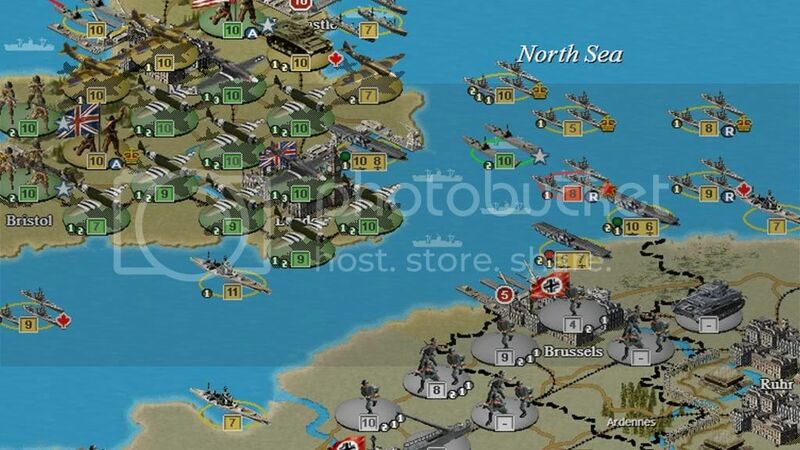 A bit annoying - the paras therefore live for one more turn. Elsewhere got another Diplo hit on Turkey, and also landed some troops in Northern Spain taking the port there. Let's see if I can bait another hook and get him to transfer forces down to Iberia! Nothing in the Pacific. US Navy sits tight. Finally the Brit Army now in Turkey is getting no supply from Tehran - Stalin really can be a bas*ard sometimes! - so it is slowly making its way out. 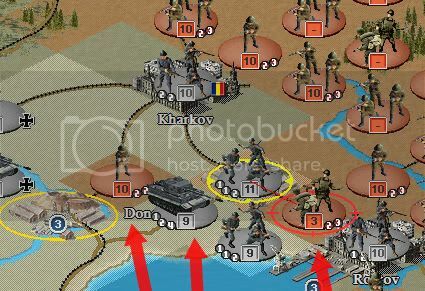 It has 2 or 3 choices as to what it does next in the Mediterranean Theatre, but it will be a good few turns before it is ready. One weird thing - the Paras I surrounded on the Maikop Oil Square had supply 3. I think that might be the same bug I noticed when I was commanding Marc's forces and had your Soviet Corps surrounded at the mine north of Rostov. If so, the good news is that it's fixed! Finally got some serious time for a turn. I spent an hour at the computer after the replay thinking about what I wanted to do. 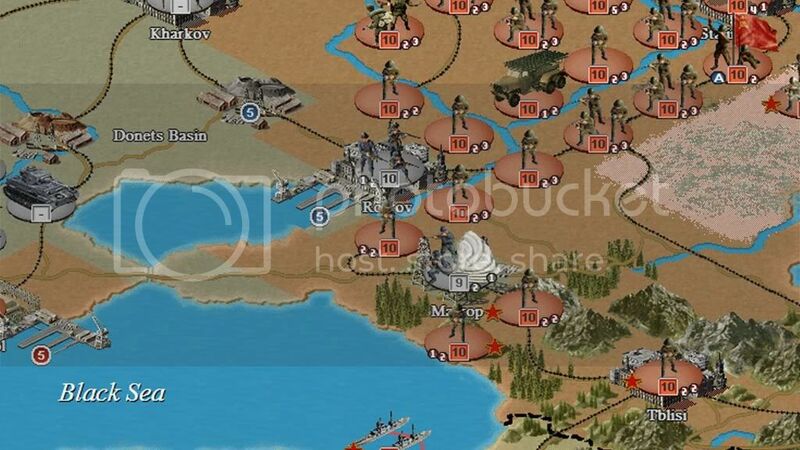 I have to be very careful as does Al because things can really change based upon what happens on the Eastern Front. That said... It was a very eventful turn... Germany struck back hard on the East Front using both air and ground for little loss in return. Scratch 1 Corp, 1 Army, 1 Special forces. I also recaptured the mine. In the picture below 1 army has already been destroyed. This is how it ended. 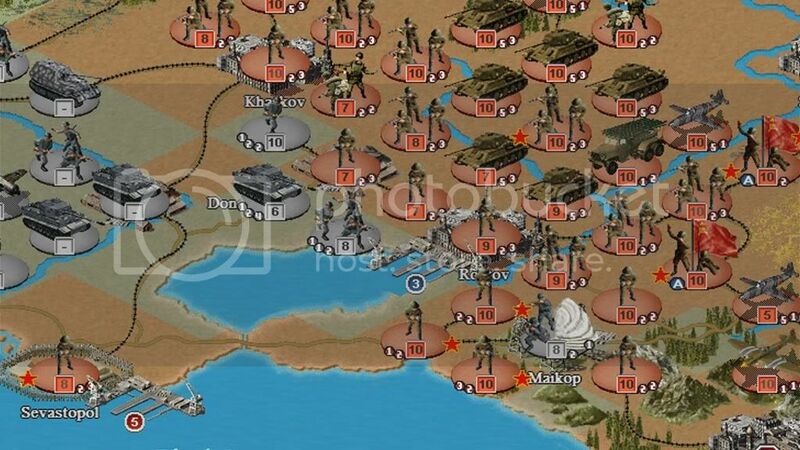 As you can see air recon and ground units show a good portion of Al’s strength. He has a lot of stuff. I do too… just out of view. Al extended them too far. This may have been on purpose. I expect him to hammer me back hard and I feel I am very ready. Germany is very powerful. Those two cities were originally intended as speed bumps. Al has yet to take them back. They will help against his counter attack. Had he taken them back last turn he would have had a freeer hand in counter attacking. Instead they will act as blocking positions that should he attack will be costly to take in a rush. In the West Brussels fell to the Germans again and the Lowlands surrendered. Scratch 1 UK corps. I actually like that because I believe I get a small readiness boost right before our major engagement in the East. If it works out that way I want to thank Al for helping. He now has 1 English corps stranded without supply. In Spain I had to redeploy a few units down there to remove the US corp. I will begin working on that next turn. I also deployed more Luftwaffe fighter units this turn. Al’s airwar over Europe has gotten very expensive. I am intentionally keeping the war in the West very low level as it's eating up his units 1 by 1 for little loss. I have only deployed 1 armor unit to battle in the West. My real power still remains in the East. I was almost tempted to really push forward this turn especially after I used a fighter to do recon and found his tanks. 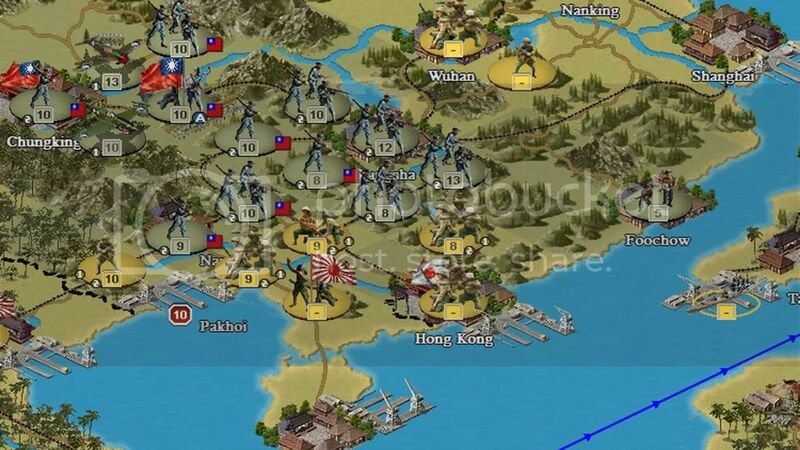 In China I forced an army to retreat up north by combined air and ground assault and in the South hit an army too. Japan is really struggling in China. No pictures of the fleet or China… plans in motion. The only really bright spot is in my fleet which is experienced, blooded and upgraded. 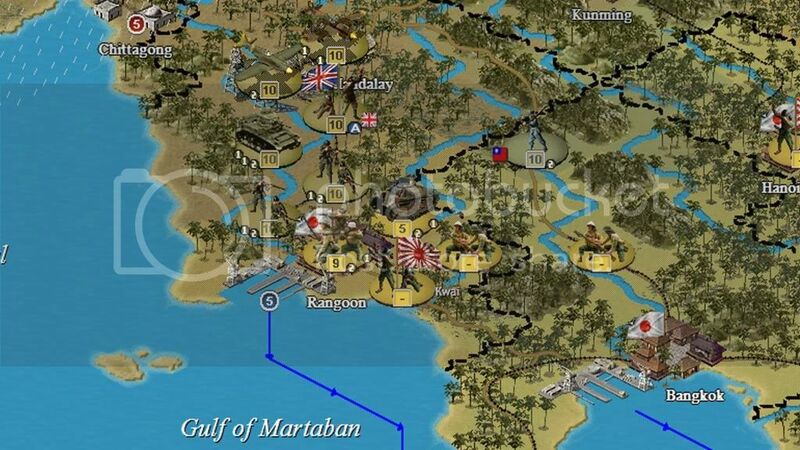 In Burma there was more attrition warfare. It is becoming expensive for the UK. In DEI I finally got my act together and knocked out that Indian army occupying the mine. All around a tough turn for the UK. All said... as I told Al I still think he has the momentum at the moment it is his game to lose. Hence the caution on both sides. That said I thought you might like to see the relative strengths of the countries. OK - the destruction of Germany has started. One point to note: Germany is strong! This wont happen quickly, especially as we are now already into August 1943. I predict it will take me until the end of 1944 to complete the job - but destroyed she will be. 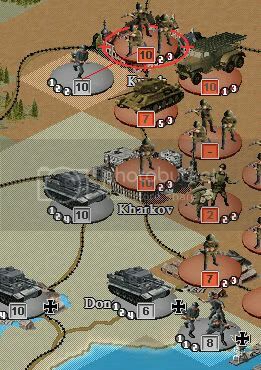 The key now is careful harvesting of units, splitting of German strength and being prepared to swap the right sorts of unit via combat. I have decided to hold nothing back from these graphics now as I dont think Marc can stop what is going to happen so intel means little. So - tactically how does one win a massive engagement? Put simply it is all down to armour and tac air; this was always the case in vanilla and it is certainly the case in Gold also. The units I pushed forward were destroyed, but in return I destroyed 3 armies and damaged the forward panzer unit. 3 of 3 is a ratio I am very happy with. Note my armour is 1 tech level up from the Germans, and note also my tech level for air. 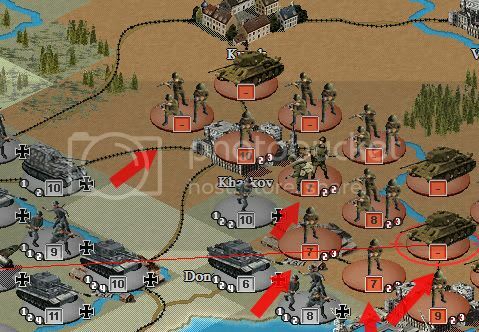 I have been hamstrung a bit by lack of motorisation: I have just received that tech so can soon plan to have very fast attacks just like the Wehrmacht, but I must admit it was annoying as the research % for motorisation got all the way to 98% before it clicked. That happens sometimes... Grrr... but it will only delay the inevitable by a few turns. The key to it all is pinning down units in the west. Now in this area another tech deficiency has also held me up, and this time I had to get it to 95% last turn before it finally clicked: US long range air. Without level 2 the tac air in the UK cannot really run roughshod over the Germans, but now that I have it I can really cut loose. The graphic below clearly shows my tactic - it is a solid and total air offensive that can destroy 1 or 2 units at a time while also wearing down the Luftwaffe fighter strength. I have no space left to deploy anything so will gradually put all my land assets to sea, ready to constantly pepper away at the French mainland while tying down units the Wehrmacht would dearly love to use in the East. I am pleased to see so many German units here, and I gave the armour in shot a good pasting - I suspect it is heavily damaged. Future armoured units that show up, now that my full air power can be brought to bear, will be destroyed. 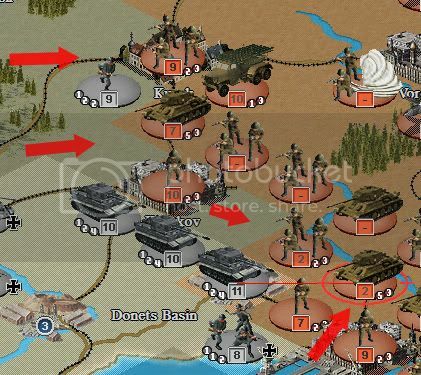 The combined weight of allied air plus Russian ground forces will seal the fate of Germany. Just for good measure intel gave me the location of the last Italian battleship in the med and I sank it. Total sea control is very important for the allies in the west, as so many ground units at sea at any one time would make tasty pickings for U boats, but the axis U boat fleet is sunk. Turkey also swung further to the allies: when she finally joins my pressure on the Germans will grow further. So all in all very happy. 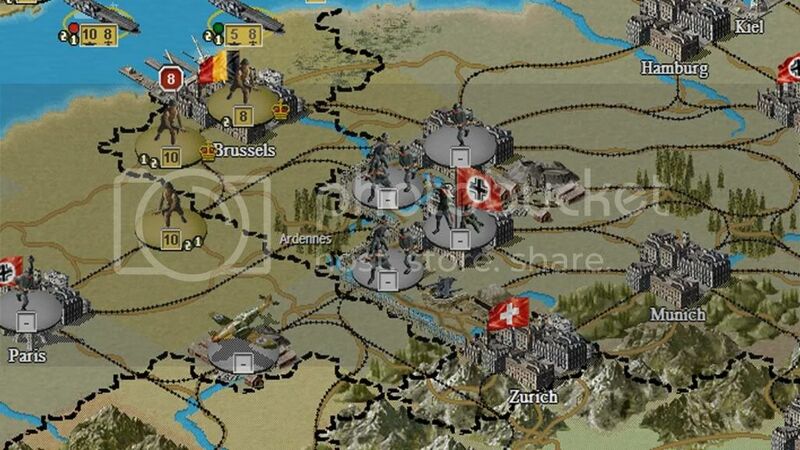 Winter will force a pause and allow the Germans to regroup a bit, but 1944 should get very nasty indeed for the axis. I'm glad this is just a game, the turning point will be bloody. I weighed my options this turn. It’s the end of August… we’re about to get poor weather… Al’s forward units were in poor supply, Al’s forces have been evicted from France… so well why not. I went all in! This may turn out to be a major error... mistake... screwup... but what the hell! It was time and besides other considerations I will outline below I was tired of our Phoney war in the East. I began by using heavy airpower air striking critical targets. My 5 TAC air units came in handy. Then I brought in armor and ground. My troops in the North attacked too. I even took back Kursk using airdrop. All in all it was a good start. As you can see I put a buffer in front of my armor. I expect them not to survive Al’s response and I expect him to do me a lot of damage in return…. He will likely take out some of my armor… if not the majority of it. However… if he advances he brings his armor further he will step into my tac air range. So in a way it is a double edged sword for him. In addition his supply situation will not be the best either. I brought up additional forces (5 armies) that were just behind the lines and out of range. They will form the nucleus for a counter punch to his response to my offensive drive. Perhaps I should have fallen back and let Al come closer to me before hitting him or allowing him to hit me. That would have risked poor weather on the Eastern Front negating my airpower advantage. This turn I destroyed 3 armies, 2 corps, 1 Special Forces and 1 armor. Al has lost 5 armies and 4 corps alone in the last 2 turns. The scary part is he can afford to lose them. I expect it to get very ugly from here on out and he still has the initiative in the West. In the East… not much to report. China is causing me some serious headaches. Weather was poor so I could not hammer Chinese units. In short Japan is in trouble in China. It is very frustrating that I cannot even damage any of his ground forces in a normal fight on the ground. My armor upgraded to level 2 is virtually useless. The only bright spot in China is my airpower and during good weather turns my Tac air can hammer him hard. I moved the IJN this turn… not saying where. Actually Marc I think you have superb timing, especially if the Soviets have outrun supply, and I'm assuming that you've saved MPPs(they're plenty expensive at level 4) to reform those Panzers you will lose in Al's turn. So, you'll be able to redeploy before good campaigning weather returns and can trade territory until then, excellent maneuver. That's the idea... though I am hoping I can punch him again hard next turn. Al lost over 11 units in the last 2 turns, I lost 3... 2 of which I expected to lose 2 turns ago... 1 Hungarian Army and 1 Romanian army. I do have a feeling whatever Al does it will hurt.